Issue #2 left me all excited with its *dumdumdum* villain! *jazzhands* ending, but issue #3 is all: but, no, you must wait more. Sigh. Katie and Clint as Hawkeyes doing Hawkeye things together are fun and bantery and good-guy as expected. I like them both. They are likeable dudes. And Kate, as per usual, pulls off some awesome action sequences as they continue to make sure those poor kiddos are safe. Meanwhile, the flashback timeline continues along the bottom and somewhat in parallel to the now events. The issue is very fluffy, and I felt it didn't really go far. 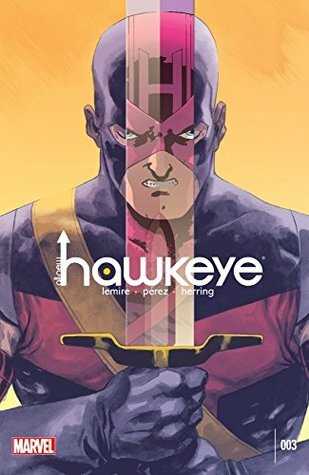 However, All New Hawkeye is my first time reading Hawkeye monthly, so I might just be accustomed to trade binge-induced plot fulfillment. Oh, and I continue to miss Aja art. dos hawkeyes son mejores que uno. I have absolutely no idea what's going on in this (maybe I should stop grabbing issues without reading the previous ones, huh), and I don't like this art style, but my favorite girls are in it and I am Amerikate trash and that's all I care about. Now were talking. First two were a bit slow. And with the flashbacks in the same pages as the running story, I was a bit lost. But now, I'm getting the groove of this. Forgot to log this.As per usual, I love Kate, and Clint is his annoying/amusing self. Hill for the win! The Hawkeyes and the kids being super domestic is cute as hell. The covers, colors, and art are amazing. Kate is a boss. Clint has the best sidekick ever. The Hawkeyes can make anything good. Jeff Lemire Ramón Pérez Ian Herring - Jeff Lemire is an award-winning Canadian cartoonist, and the author of the Essex County Trilogy, Sweet Tooth and The Nobody. Lemire is known for a his moody, humanistic stories and sketchy, cinematic, black-and-white art.